Today the Landgericht Düsseldorf (Düsseldorf Regional Court) has dismissed an Apple complaint according to which Samsung violated Germany's Unfair Competition Law by exploiting the iPhone's product image through a derivative imitation of its key characteristics. The decision was announced almost three months after a trial at which the court actually appeared inclined to agree with Apple. I didn't attend the announcement but asked a spokesman for the court. In this lawsuit, Apple accused six Samsung smartphones (Galaxy S I, Galaxy S Plus, Galaxy S II, Galaxy Ace, Galaxy R, and Galaxy Wave M) and one Samsung media player (Galaxy S WiFi 4.0) of constituting unlawful imitations of its iPhone and iPod products. In January 2012 an appeals court (the Oberlandesgericht Düsseldorf, or Düsseldorf Higher Regional Court) upheld a preliminary injunction against the Galaxy Tab 10.1 on unfair competition grounds while the lower court had not reached the question of unfair competition after finding a Community design (EU equivalent of U.S. design patent) infringement. Presumably Apple will appeal today's decision to that same appeals court, and it's possible that the appeals court will once again agree with Apple on an unfair competition claim. The basis for today's decision was a comparison of Apple and Samsung's products, not an analysis as to whether a particular product infringes a given patent (or other registered right). Samsung and Google's "patent on rounded corners" propaganda was wrong anyway, and I debunked it a year ago by showing that the design patents at issue in the California litigation cover only the combination of a variety of design elements, and that combination has several more limitations than just "rectangular shape" and "rounded corners". But it's a fact that patent offices frequently grant overbroad patents and aren't aware of all of relevant prior art. Furthermore, there can be differences between a patented design and the products the same company builds -- not every "iPhone patent" was or is actually practiced by the iPhone. Here, the test under German unfair competition law has nothing to do with who registered or granted what kind of right at a certain point in time. Just this week Samsung brought a couple of motions in its first California litigation with Apple that involved (not exclusively, but primarily) requests that the court bar Apple from making "copying" allegations at the limited damages retrial in November. 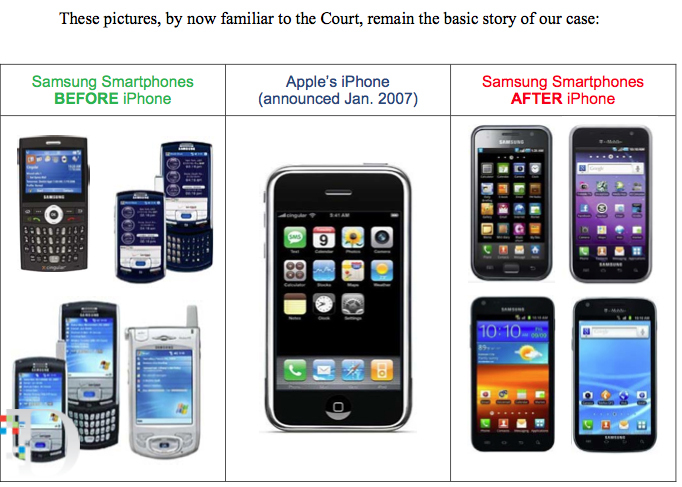 Samsung claimed that Apple intended to "smear" it this way, and to "inflame the jury". It doesn't want judges, juries and the general public to hear this story. A TV comedian, Conan O'Brien, made fun of Samsung's denial of copying in a video. I've bought various Samsung Galaxy devices already and plan to buy more in the future. The problem with copying is one of originality, not of quality. At the same time, it wouldn't be rational to blame Apple for enforcing its rights -- be it through patent litigation as in the United States or through unfair competition litigation as in this Düsseldorf case. Even if there are cases that Apple doesn't win, its enforcement efforts at least deter copying. If Apple never enforced, too many phones would look like the iPhone. Unfettered plagiarism would really limit consumer choice at the end of the day. Even lawsuits that Apple doesn't win help to draw the line. Of course, when Apple wins, the benefits are far greater. But even a non-win is not the same as a loss. There were some judges in the UK who wanted to deprive Apple of the right to fight for uniqueness. They sought to humiliate Apple through "publicity" orders that I believe have no place in a free and democratic country. Dictatorships may require dissidents to speak out in public against their beliefs; democracies, however, favor pluralism. I couldn't understand the UK approach to Apple's design rights enforcement, especially since the UK courts normally enjoy a great reputation -- and especially a reputation for rationality -- in connection with intellectual property. The most Apple-hostile one of those judges showed what I consider rather poor judgment by joining Samsung's litigation team (in a non-Apple case) only a few months later. No Samsung-friendly foreign judge, however, can bar Apple from pursuing claims in Germany under unfair competition law. With a Community design (the EU equivalent of U.S. design patent) there's at least an argument that a court in one EU member state can adjudicate, if certain criteria are met, disputes on an EU-wide basis. Not so in the case of national unfair competition rules, which are inherently a country-by-country issue. Apple is not even the only company to accuse Samsung of "copying". Just last week, British manufacturer Dyson announced a lawsuit (in the UK) accusing Samsung of a "cynical rip-off" in connection with vacuum cleaner technology.. Of course, this a different case with a different set of facts. What all of these cases have in common is that they are about striking the right balance between intellectual property and competition. Enforcement must be reasonable, but infringement must not be a profitable business strategy. If remedies represent merely a cost of doing business, innovation is in jeopardy.